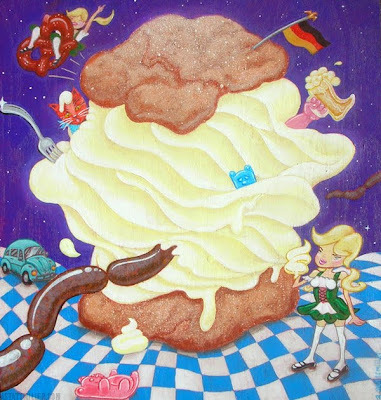 I have been revisiting the foodie theme for a few years now and what better than paint a giant Cream Puff! This one hits on a bit of a personal level, being that I have German ancestry and all. Plus, cream puffs are freaking good as "BLEEP"! When was the last time you sank your teeth into that powdery crust and discover that cold sweet nectar of whipped deliciousness inhabiting that hollowed out crust of sugary bliss!